There's no denying the expiration dates of each season's trends. What might have been the It shoes last summer have certainly been retired to the back of the closet. And there are a few trends in recent memory that have been slowly fading away in 2017. Namely off-the-shoulder tops, skinny jeans, and yes—even millennial pink. While these trends used to be everywhere, they're set to fall to the sidelines come 2018. First up, puffy-sleeve tops. Designers like Jacquemus have put this '80s silhouette on the map—and we see no signs of it slowing down in 2018. Another trend we're starting to see? Baggy denim. Yep, those oversize silhouettes popular in the '90s are making a triumphant return. 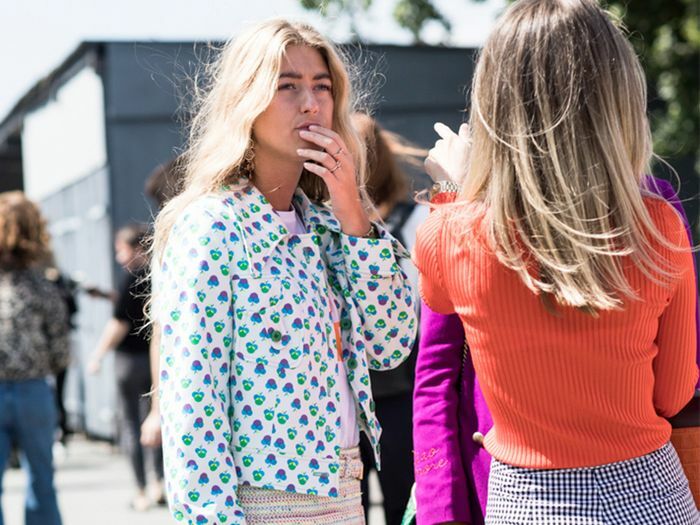 Polka dots will also continue to reign, with everyone from Monse to Ganni delivering their own version of the classic print. Lastly, lavender is poised to be the color of the spring season. Fashion girls have already adopted the cool pastel color after seeing it on some of the biggest spring runways. Go on to shop our favorite upcoming spring trends. For a polished look, tuck this top into white trousers. The perfect top to wear with your vintage jeans. Coordinate a monochrome look by pairing yours with burgundy pants. This structured top is modern and chic. Dress this blouse up by wearing it with black leather leggings and ankle boots. Go for a sophisticated look by styling these with black pointed-toe heels and a white blouse. Wear with light-wash denim to complete the look. The perfect midi dress to pair with white boots. Rock this statement jacket with cropped flares. Finish the look with leopard-print heels. Wear this blazer over a cool graphic tee. Tuck this blouse into your favorite jeans. Show off the tie belt by wearing it with a cropped sweater. Go for a relaxed look and wear these jeans with sneakers and a white T-shirt. Pair these with a gray sweater for a day out in the city. Wear these baggy distressed jeans with metallic boots. Next, read about the ankle-boot outfits fashion girls can't quit.